NEW DELHI: The Arvind Kejriwal Government on Saturday scrapped its plan to implement the Odd-Even car rationing scheme for five days from Monday. 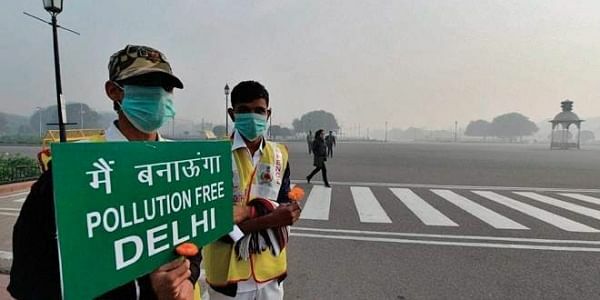 The Delhi Government’s decision came hours after the National Green Tribunal (NGT) ordered that there would be no exemptions for Government officials, two-wheelers and women drivers. The Delhi Government plans to appeal to the NGT on Monday to review its order. However, the green tribunal exempted CNG vehicles, emergency services such as ambulance and fire, and vehicles carrying waste. The exemption to motorcycles and scooters was not allowed after the Central Pollution Control Board (CPCB) and the Delhi Pollution Control Committee (DPCC) told the NGT that two-wheelers were more polluting than other vehicles, and emissions from them accounted for 20 per cent of the total vehicular pollution. The scheme that was to be rolled out from November 13 to 17, had announced exemptions for women drivers, two-wheelers and vehicles carrying children in school uniforms, besides VVIPs. Under the Odd-Even scheme, private vehicles are allowed to run based on the last number of their licence plates. Odd-numbered four-wheelers are allowed to run on odd dates, while even-numbered vehicles can only run on even dates. Soon after the NGT’s decision, the Delhi Government called an urgent meeting over the issue and decided to appeal to the NGT on Monday requesting it to review its order. “In light of the two conditions placed by the NGT on two-wheelers and women, at the moment we are calling it off. We will go back to the NGT on Monday to file a review petition requesting it to reconsider the decision regarding the two,” said Delhi Transport Minister Kailash Gahlot. “If 30 lakh two-wheelers are not allowed to ply, the public transport system in the city will not be able to cope with the pressure. Also safety of women is always a prime concern of this Government and it is paramount,” said Gahlot while addressing the media. “The Government feels that considering the large number of two-wheelers in Delhi, unless an adequate number of buses are available, implementation of the Odd-Even scheme will cause great hardship to such people. It is not feasible to arrange such a large number of buses at this stage,” the Delhi Government said in a statement. Swati Maliwal, chairperson of Delhi Commission for Women also raised questions over the green panel’s order. In its order, a Bench headed by NGT Chairperson Justice Swatanter Kumar said that the Odd-Even scheme should be implemented without any default as and when the PM10 (particulate matter) levels go above 500 micrograms per cubic metre and the PM 2.5 levels cross the 300 micrograms per cubic metre limit in a span of 48 hours. The tribunal asked the EPCA to reconsider the four-fold rise in parking fee. It also questioned the National Highways Authority of India and National Buildings Construction Corporation (India), as to why the Bench shouldn’t impose exemplary cost for violating its order to suspend all construction activity.